DANCING STARS is an original quilt design by our own Maple Leaf Quilter, Janis Nelson (below). Patterns are available from Janis or locally at Lolly's in Shipshewana. The stars are foundation-pieced to make it easy! And you'll have lots of fun collecting dozens of yellow (gold!) and blue fat quarters to make it really sparkle. 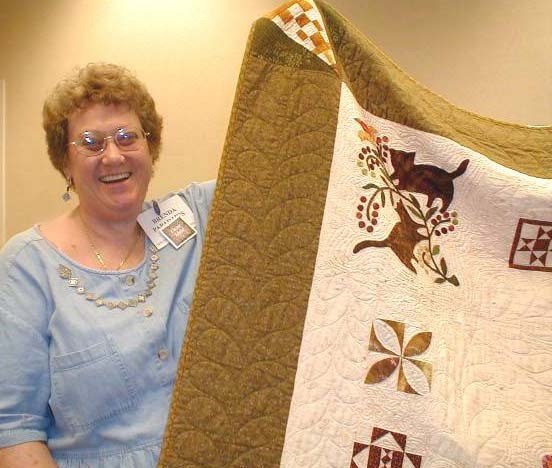 Janis Nelson has been a member of the Maple Leaf Quilters since our beginning in 1996. She has been a prolific quilter-- producing an amazing number of quilts for a full time working mom and wife. We are excited about one of her most recent quilts and the pattern she's developed for it. MLQO: Who is Janis Nelson? JN: Janis Nelson lives at Shipshewana Lake, Shipshewana, Ind. I've lived there for 15 years. I'm married to Terry Nelson of Shipshewana. We've been married for two years. We have three children, John, Jared and Aubrey. I work full time at Coachman in Middlebury. I have been with there for five years. We have a 57 acre farm six miles east of Shipshe. Terry has his cattle there and I have a small garden. MLQO: When did you get started quilting? JN: In 1982 when my sister had he fabric store in Goshen, I took a quilt class there that Elizabeth Garber taught. It was a six week class that covered all the basics and I've not stopped sewing since. MLQO: What is your favorite type of quilting? JN: Oh my. Let's see. All of it of course. I can't say I like any in particular. Its all fun to do. I think being creative would be my most favorite. MLQO: What inspires you to quilt? JN: The door that's there to be opened, to put my ideas into a quilt. The challenge to see if I can do it or not. One of my most favorite quilts and memorable quilts was the "Farmer Boy" quilt I made for my son when he was born. He called his quilt "His Boys." "Where's my boys?" he'd say. Another is the Kite quilt. We [my son] and I went to a national kite flying competition about nine years ago, on the shores of Lake Michigan. The kites were beautiful, so many of them, and the colors of the kites were unbelievable. So I drew what I saw that day and made it into a quilt. There are a few more, but those two stand out in my mind the most. MLQO: What was the inspiration for Dancing Stars? JN: With the new year I wanted to make a quilt with stars in it. I wanted a not so perfect star, a little different shape to it. You know what I mean? Anyway, I liked the star block I made, but I didn't want the entire quilt to be stars. So I came up with the pieced block (with a little help from my husband - he helped with colors). This is what I ended up with. For about three months before the new year I started collecting gold fabrics ("yellow" to most people, "gold" to me). The rest of the fabrics used were from my stash. OH, I take that back. I bought fabric with the new millennium prints on them. But most was stash. MLQO: Dancing Stars is a great design Janis. Thanks for sharing about yourself and your journey. UPDATE on Cancer Treatment Centers of America Quilt. MLQ used the Monday, June 26 evening guild meeting as a work night for the CTCA quilt. The quilt is being made to hang in the lobby of the new Cancer Treatment Center building in Goshen. The blocks will include anything that "celebrates life" - flowers, trees, animals, activities, people, toys, events, etc. We have most of the foundation pieced blocks done, many on-point corners were sewed to these blocks during the evening, Fran and Carol did the layout of the watercolor background for the center medallion. Elaine is going to do the piecing of the center, and Janis will do the the appliquéd design in the center. We are currently discussing quilting options. For more information contact Liz at 535-2834 or e-mail lmartin@goshenhealth.com . Monday, July 10, 7:00 PM. Sew What/Business Meeting. Monday, July 24 -- No meeting. Monday, August 28, 6:30 PM. Regular Meeting at Waterford Mennonite Church. Lessons on Reverse Appliqué (tentative) and Introduction of the Fall Mystery Quilt, "Bermuda Triangles:"
Middlebury Harvest Festival, October 5, 6 and 7. MLQers Elaine, Janis and Edith are the committee planning our participation in this annual local event held on the Essenhaus grounds. We will be doing quilting demonstrations and providing hands-on opportunities. This is a well-attended event. If you have ideas for the committee, please share them. April 29 through July 30, 2000. Indianapolis Museum of Art-Columbus Gallery (located in Columbus, Indiana) will be exhibiting a collection of Marie Webster Quilts. Vermont Quilt Festival, July 20 - 23, 2000. This year's special Dear Jane exhibit will include a group of six small quilts from MLQ, (click here to see the quilts after 5 of the 6 rows were done) a Dear Jane Rows of Sharing round robin project. Quilters include Edith, Marie, Fran, Janis, Paula and Carol. Marie and Edith will be traveling to Vermont to see the show. And of course, our Honorary MLQ Brenda Papadakis will be there! This picture was sent by my friend Corien from the Netherlands of Brenda's spring trip to Amsterdam. Elkhart County 4-H Fair, July 21 - 29, 2000.. Several Maple Leaf Quilters are planning to exhibit quilt projects at this year's fair. Projects to be exhibited will need to be at the fairgrounds on Monday, July 17. Below is a reprint of the exhibit information. For more information contact the Home and Family Arts Department, Aloma Scott, Director, 295-1674. 1. Open to anyone. An exhibitor may also be a participant in the "Craft Potpourri". Special arrangements can be made for release of exhibits going to the Indiana State fair, please notify the workers at check in. 3. It is the responsibility of the exhibitor to know which department, section, and class name and class number to enter. Example: Food Preservation: is the department, Meat is the section, and the class number is 401 Beef. 4. The Fair Board will NOT be responsible for damage or theft of articles. 1. Entry fee is $1.00 for single entry OR $20.00 entitles you to admission pass of seven (7) daily tickets and up to 20 entries. A person can enter as many classes as they want, but after the first 20 entries, the cost will be an additional $1.00 per class. Only one entry can be made in any one class. Tickets must be purchased at time of entry. No refunds will be made. 2. Check in times for entries are: Monday, July 17, 2000, 1:00 to 7:00 p.m. Foods and Cake Decorating, Thursday, July 20, 2000, 7:30 to 11:00 a.m.
3. Children aged 7 and under before December 31, 2000 may enter categories designated under the heading "Children's Corner". No entry fee will be charged and only ribbons will be awarded (no prize money given). Older children age 8 and above by December 31, 2000 may enter exhibits the same as adults. 4. No Duplicate entries: This means you cannot enter the exact same item in more than one class • NO EXCEPTIONS! 5. Exhibits entered in the wrong class will be disqualified. 1. General entry judging is CLOSED. 2. Foods and Cake Decorating will be judged, Thursday, July 20, 2000 at Noon. The public may observe the foods judging; however, contestants are asked not to converse with judges, or their exhibit will be disqualified. Judging order will be: President's Baked Item Children's Food, Foods and Cake Decorating. THE REST OF THE BUILDING IS NOT OPEN TO THE PUBLIC. 3. Premiums are: first • $3.00 and ribbon; second • $2.00 and ribbon; and third • $1.00 and ribbon. A Sweepstakes ribbon will be awarded in each section and a $10.00 ''Best of Show" will be given in each department. The judges are instructed not to award premiums unless the articles are deemed worthy of merit. 1. All exhibits must stay in place until 3:00 p.m., Monday, July 31, 2000. Exhibits removed without permission will forfeit any premiums awarded. Exhibits must be removed on Monday, July 31, 2000, between 3:00 and 7:00 p.m. NO PICK UP UNTIL STATED TIME. 1. See general rules and regulations for Home and Family Arts Department. 2. Section A1, A2 and A3 all work • piecing, appliquéing or embroidery and quilting must be done by only the exhibitor. 3. Section B1, B2 and B3 all work ~ piecing, appliquéing or embroidery and quilting may be done by two or more persons or a group; example: one person pieces, another quilts. Imagine -- It's your birthday and you've just been presented with an armful of fabric fat quarters in all your favorite quilt fabrics and colors! Hey, join the Birthday Fat Quarter club and it will happen. BEAUTIFUL Handed Dyed Fabrics By Fran. Available for sale at our next guild meeting. Fran's got more fabric and new colors too! You can contact Fran through e-mail at FranCanDo@aol.com. Here's a wonderful web site. You've seen their catalog and you know how great their prices are, well visit the web site for more surprises. Lots of web sites show you the cover of the quilt books they are selling, but at Connecting Threads with the click of the mouse you can view up to twelve pages of the inside of the book, plus the inside cover and back cover of the book. Books are always priced several dollars below retail. Notions, fabrics and patterns are priced right too. Their service is fast. I love this place! A new feature online allows you to create a fabric design palette -- just click on the fabrics you like and they will show up on your palette, you can mix them, rearrange them to see how they look beside each other. Then just one more click adds them to your shopping cart to buy.